Our middle son Gustav is attending 10th grade at a boarding school. He has chosen this school specifically because it has got a very good equestrian line. It is possible to bring your own horse/pony which is what Gustav has done. A couple of weeks ago he called me on the phone and told me that their math teacher had enrolled the school in a nationwide contest about building model houses. There were some regulations concerning the design, such as maximum area, only one level of living space allowed etc. And the idea was that all the houses had to be drawn and built to a scale of 1:50. I wished that there had been math projects like that when I was in school, because I believe that it is a lot easier to get kids interested and involved in learning something - if they can actually see a purpose of what they are being taught. So with this project they are not only taught about scale - they get to experience it as well. Gustav told me that he immediately remembered building those model houses when he was younger, and considered doing that again. But since I am at sea, I couldn't provide him with strips of wood, and I wasn't sure how much stock was left over from last time Asger built a model church. Besides, the stock that I had made would likely not be fitting for a 1:50 scale build. About a week ago I asked Gustav how the project was coming along, and he told me that he and his team mate had managed to saw out some strips on their own using an electric fretsaw/jigsaw. And they had made the exterior cladding out of Masonite board. This Friday he called me and told me that their house had won the school contest, so now they had entered the national contest. 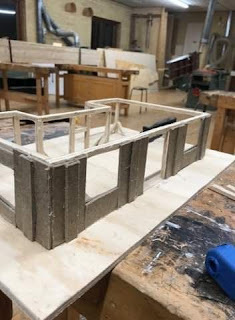 He told me that all the other houses at the school had been built out of model cardboard, this stuff that has got a bit of foam sandwiched between some paper. So their house had stood out really proud compared to all the rest. Due to time constraints they hadn't had the time to make the roof, so their model was displayed with the rafters visible. But he assured me that they had some more time to complete the house before sending it off to the final contest. So they plan on making a roof and also mounting some windows and doors. 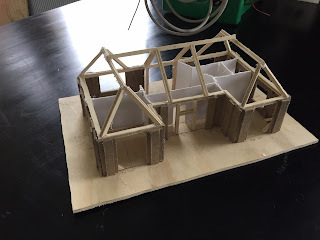 I am proud that Gustav and Malthe won the school contest, but I am even more proud that those "house building seeds" that were sown five years ago have flourished and stayed within the brain of Gustav, in a way that he immediately connected model houses with building something out of wood in that way. That's a good looking house, there are a lot of structures in the US that could use Gustav's and Malthe's talent. Great job on the model, too. I'm not surprised considering Gustav's heritage. I have to admit that I am pretty impressed with the result as well. Looks like what we would call post and beam on this side of the big pond. I am not quite sure what it would be called on this side, since it is actually a rather unusual way to build a house over here. Most houses in Denmark are made with bricks for the walls. Very impressive - a budding architect, perhaps? He got hooked on the helicopter idea a couple of years ago after seeing a documentary on the Danish army. So he is making sure to get take all the required classed in school. Great school project. No such things in my school as well, can imagine it being a good learning experience in both math, geometry, proportions, sense of room and a feel for volume and aesthetics. Hope they win! I think you nailed it pretty accurate with all the benefits of building something. There is a world of difference between drawing something on a flat piece of paper, and seeing it as a 3 dimensional structure. It looks better than some I built back when I thought I wanted to be an architect and I was in University at that time. Good on Gustav and Malthe. I can't claim to have built such a good looking house model either. I am still most impressed with the two of them carrying on with it from scratch, sawing out beams of a piece of plywood and thinking of using Masonite as cladding. Creative thinking like that is definitely something they should be commended for. Bravo, pass on my congrats to Gustav and Malthe. I texted Gustav this morning, and told him to check the comments section of this post. He was really happy to see all those nice comments. I think that you are correct in the idea that there are no losers in such an event. Getting kids to be creative with their hands surely is a bonus. Besides having a fine equestrian line, this school is currently building a new craftsman center/workshop of around 400 m2 as far as I remember. their idea is that those kids who would like to pursue a career as carpenters or bricklayers etc. should be able to start doing so already in 9th or 10th grade. I personally think that is a great mindset. I have seen on Toolerable log that you have lost your Mother. Please receive my sincere condolence.